Blog comments suffer from a bad reputation nowadays, with many popular blogs disabling them all together.Comments are often a space for spam, trolls and cyber-bulling, all of which are a pain for bloggers to moderate. However, comments themselves are visible evidence that people are actually reading what you’re writing. Further, they are great for attracting traffic to your blog, and not just through spam. If you comment on other sites or blogs, your will be more visible simply through inbound links on the web. 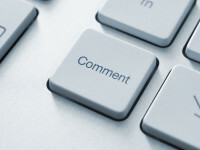 Most blogs come with their own comment system, but often it is just a stream of comments. Using a custom comment system allows you to filter out some of the negative aspects mentioned earlier. Custom comment systems force users assign a picture Gravatar, or “Globally Recognized Avatar.” When you see a Gravatar, you can be assured that the commenter is an actual person instead of a spam bot. These systems also often allow for commenting on other readers’ comments, otherwise known as threaded commenting. Disqus: We use this commenting system on our blog. It has a great spam blocker included in the system that allows for most spam to never see the light of day on your blog. It also allows users to create an identity that transcends a single blog. Your comments will link to a profile, and your profile will link to other blogs you’ve commented on, giving bloggers an idea of who their commenter’s are through their online presence. This can drive traffic to your blog, and also help you find other blogs that may interest you. You can also link your profile to your Facebook and Twitter accounts. Engag.io: This web application is an inbox with analytics for all of your conversations on blogs and social networks. It watches for comments posted to and from you and dumps everything into one inbox for you to track. You can also search for certain comments in order to stay engaged with people who comment on your blog posts the most. Livefyre: This tool offers a more social approach to blog commenting. Your profile is tied to your Facebook and Twitter accounts so that you can draw your friends and followers into the conversation. Further, you can @reference people in the conversation, and they will receive notifications that you’ve mentioned them. You can also share links directly in your comment with a Twitter-friendly shortened URL. Which do you prefer? Feel free to use our comment system to let us know!